Amy Houlston at Burgess sends news of a new addition to the charter fleet in the shape of Codecasa's 51m motor yacht Emelina. 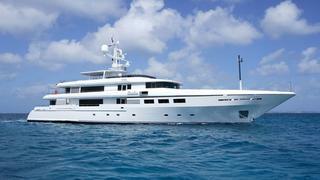 Built in 2008, she has a light, classic interior and features both formal and alfresco dining areas. Accommodation is for 10 to 12 guests in five staterooms including a very large master suite with a sea balcony. Weekly charter rates on Emelina are €217,000 in high season and €196,000 in low season.